Staff tab is where managers manage the company Staff profiles along with the Locations & Positions. 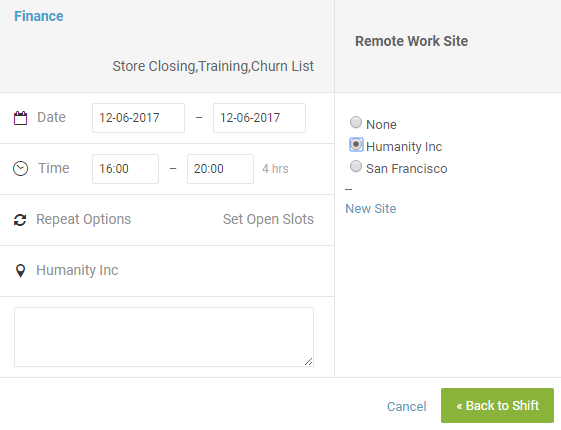 When you click the Staff tab, it shows two options on the top left for Employees and Locations & Positions. 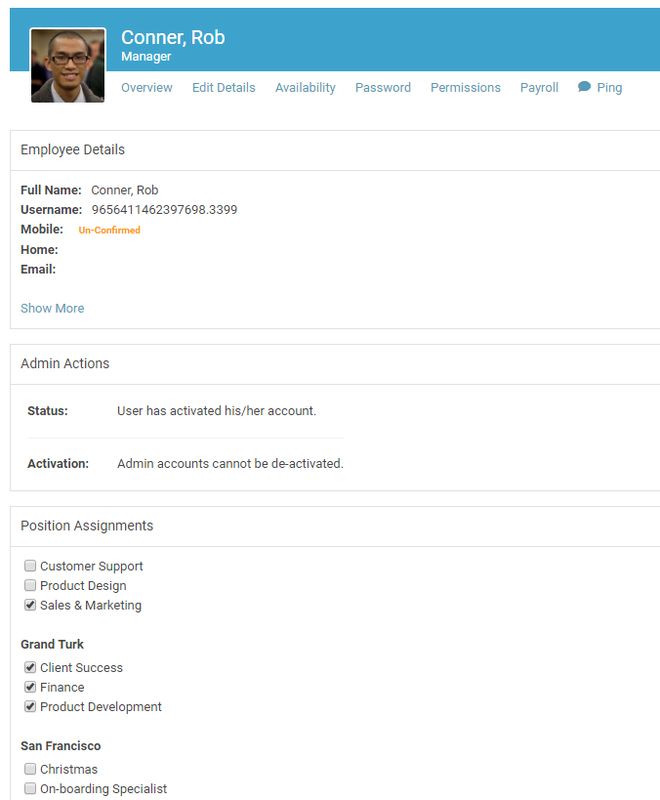 On the top right side, you will see the option 'Add Employees' as well as Arrow Down icon that opens the panel for additional Action item regarding Assign Positions, Manage Skills and custom fields, etc. 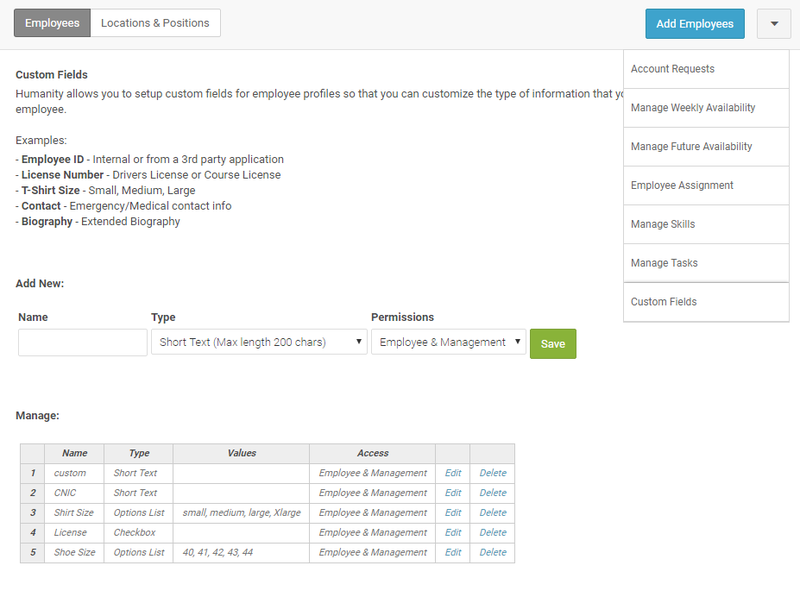 Click the option 'Add Employee' to quickly add multiple employees using the form or by uploading the .csv/.xlsx file. If enabled by management, employees will be presented with a group listing of all staff members when they click the tab 'Staff.' The view of the Staff tab can be changed to Gallery or to 'Custom' view from the icons at the top right. This view allows you to select specific fields you might want to show when viewing profiles at a glance. Also, the custom fields can be saved as CSV|XLS to the computer for printing purposes. From the tab Staff, click the option 'Locations & Positions' to add/manage your business locations and Positions. Individual work schedules are labeled by ‘Positions’ that are grouped by ‘Locations’ in Humanity™. Once this is set, the Staff can be divided into multiple locations based on assigned Positions by the manager. Employees can see co-workers that are assigned to any specific Position, just by clicking on that position. 'Remote Sites' are locations for shifts and events outside of your primary work locations and are assigned directly to shifts. These could be client locations or contract locations for example. Staff can see the remote site with the address in a Google Map directly from their shift details. Employees must be assigned to the appropriate Locations and Positions. 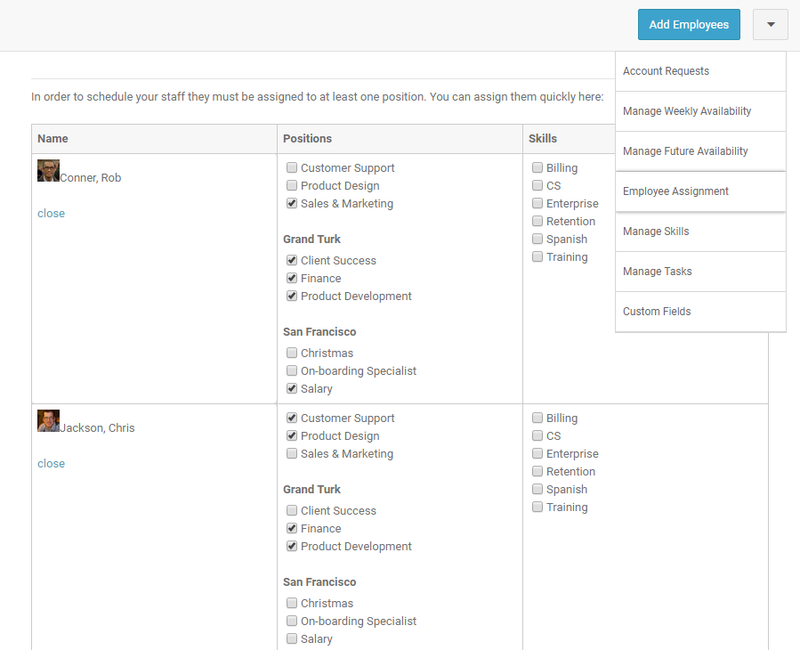 Click on employee profile to assign the positions. 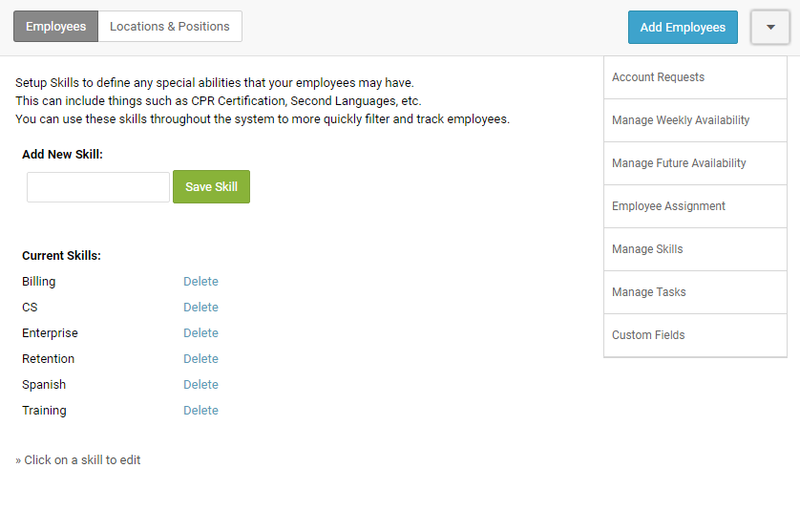 Or click the arrow down Icon next to Add Employee button from the top right to assign multiple staff in bulk. Here you can Assign By Employee, Assign by Position or Assign by Skills. Click the arrow down Icon next to Add Employee button from the top right of the Staff tab. Skills define any special abilities your employees have. .' can include things such as CPR Certification, Second Languages, etc. Adding expiration on certain skills, allows you to receive notifications and keep track of skills such as 'certifications'. You can use these skills throughout the system to more quickly filter, schedule smartly and track employees. Click the arrow down Icon next to Add Employee button from the top right to set up the Custom Fields for staff profiles so that you can customize the type of information that you want to save with each employee. 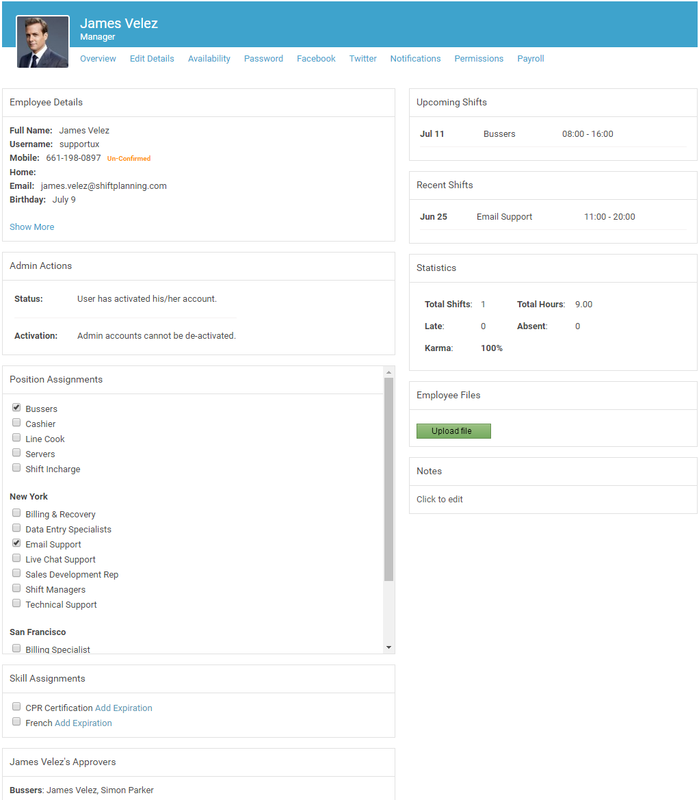 Click on an employee profile to manage the details e.g. Profile Image, Edit Profile Details, Activate accounts, set Password, Permissions, etc. Notification will only show up when you open up your profile, letting you control what notification should you receive. Permission level allows you to give more access to profiles in terms of allowing access to read/write schedules, time sheets, and approve requests, etc. This is where you can assign multiple wage rates per position.